Exaeroman: Why is the Left Demonizing Devin Nunes? Devin Nunes has become the poster child from the left's point of view of the blindly sycophantic Trump apologist. His sole purpose, according to them, is to run interference for Donald Trump. Any attempt to investigate the Justice Department or the Intelligence Community is nothing more than a transparent attempt to sabotage the reputations of those noble, vigorously non partisan, and infallible servants of truth, justice, and the American way. And oh, by the way, in the process he aims to destroy the credibility of the Mueller investigation. I don't believe that, and I'm not sure if the folks on the left really believe it either. They may just be attempting some character assassination of their own on a target who seems pretty effective in exposing the glaring flaws hidden down in the bowels of the deep state. 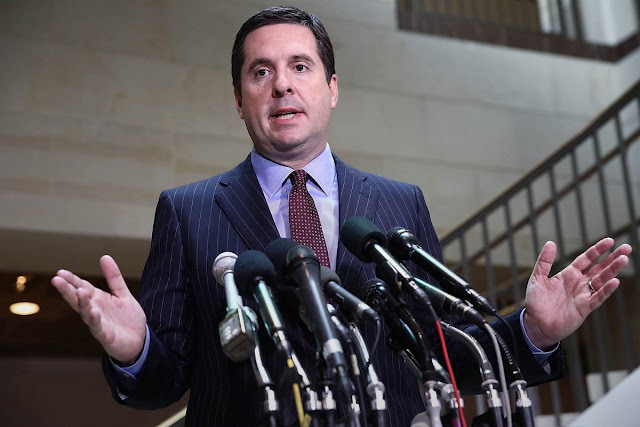 I'm not going to waste a lot of time trying to resurrect the reputation of Devin Nunes. But I am going spend some time examining the circumstances of the incident that brought him to prominence as a favorite target of the left. Some one or some ones came forward through proper channels to inform Nunes of irregularities in the dissemination of intelligence products. It seems clear that many of the journalists didn't understand the meaning of the phrase "incidental collection" by the questions they repeatedly asked on the subject. There are all kinds of communications data that are routinely monitored by the intelligence community. How they perform that monitoring is strictly controlled by rules, some of which are in place to protect the rights of American citizens. The monitoring might be for a criminal investigation, a counter intelligence investigation or routine collection from foreign sources NOT associated with any specific investigation. Nunes was reluctant to characterize the nature of the collection he was shown, possibly because, as he said, he only saw a limited amount of data related to perhaps a few dozen incidents. There may have been more that he was as yet unaware of so he was reluctant to characterize what he saw. Or perhaps it was a mix of routine, criminal, counter intelligence collection. Whatever. The point is, The intelligence community can legally listen to communications between foreign persons and US persons and between foreign persons ABOUT a US person. But, in the recorded data about this monitoring, the name of the US person must be masked to protect their 4th Amendment rights "to be secure in their persons, houses, papers and effects." If there is no reason to suspect the American of anything criminal, then the name remains masked. If it sounds like the American person is part of something criminal, then certain persons can request an unmasking of the name when included in the intelligence reports. But there has to be good reason. Nunes is suggesting that he discovered multiple incidences of unmasking when there was no obvious intelligence or law enforcement value. Perhaps only political value. So what he never quite says, but what he is clearly worried about is that someone (we later learn that the big offenders were Susan Rice and Samantha Powers) was unmasking names of Trump and/or Trump associates during the transition for no discernible legitimate reason, and incorporating the information into distributed Intelligence Community products. Separately, it has been reported that in the last days of the Obama White House, the distribution lists of the various intelligence products were significantly expanded. Someone was intentionally making an effort to disseminate a broader scope of covert communications intelligence to a broader cadre of people. You could argue that there could be a legitimate reason for it or an illegitimate reason for it as Nunes suspects. The point is, it happened. Denying it happened is the first step to damaging the credibility of the deniers. Trump got the technical language wrong, and the Nunes information refers mostly to the transition, not the campaign, but the essence of what Trump tweeted was accurate. Trump was widely criticized at the time for tweeting uncorroborated nonsense. Turns out he was right. From this series of press conferences up to the present day, Devin Nunes has been the target of constant barrage from the left. Here's a link to an LA Times story. Its tone is more polite than most. It's mostly factual, but the anti Nunes bias bleeds through never the less. I think I can correct for their bias. Read the story first. It's short. The hit on Nunes from this time forward has been that, though we haven't learned the identity of the source, we have learned that he or she was located within the White House. And since the source of the information was in the White House, Nunes' going from the Congress to the White House to inform the president had to be play acting for dramatic effect. That's crap. As a Nunes' spokesman later explained, the material was classified and the property of an executive agency that had not previously provided it to the Congress. Furthermore, it had to be viewed in a classified setting. I assume they're referring to a SCIF. A Sensitive Compartmented Information Facility. Congress has a SCIF, but the information was not located on Capitol Hill. Let's speculate the executive agency that has the information is the NSA. I think that fact may have actually been subsequently revealed. I'm not sure, but it isn't relevant to this discussion. Maybe the source is someone working at the White House, but not someone with direct access to the president. And transporting such material must conform with significant safeguards. So the story that Nunes had to go to the White House to view the information in their SCIF instead of the information being brought to Capitol Hill to be viewed in the Capitol Hill SCIF is totally credible. I can think of plenty of people in the White House who could have brought the information directly to the president without involving Devin Nunes. Maybe someone on the National Security Council. But that's not the point. All one needs to do is to come up with one person who works inside the White House whose chain of command does NOT lead directly to the president, but who might logically be expected to respond to Nunes' request for information which he refers to in his press conference. That person would need Nunes to come to the White House to view the information. I don't know who that person might be or what their job description would be to fit the criteria that I just described, but it is NOT far fetched. Folks on the left (cough, Adam Schif, cough) whose motivation is to cover up malfeasance on the part of the Obama Intelligence Community, FBI, DOJ, and National Security staff or other so called deep state actors might use Nunes' back and forth to create a narrative of over dramatization for effect or a lack of credibility on Nunes' part. The truth might be a lot more obvious and a lot less nefarious. This statement implies that Nunes had been misleading journalists during his press conference and that Nunes had claimed Trump or Trump aides had been the target of illegitimate surveillance . As I mentioned earlier, Nunes went out of his way to clarify that Trump or his aides were not the targets of illegitimate surveillance, but the subjects of incidental collection that were illegitimately unmasked. There's a big difference, and despite the journalists at the press conference having a difficult time understanding that, Nunes bent over backwards to repeat several times where his real concerns lay. When you're starting to take flak, it is a sure sign that you're over the target!